Well my overdue Granddaughter is taking her own sweet time to arrive and meet her Mummies and Grandmummies and the rest of the family. She was due on the 6th and she is still not here. 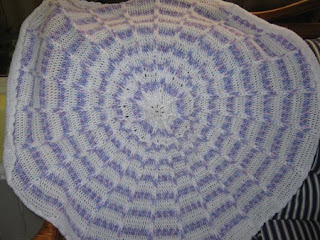 Not sure if I showed you the Baby blanket I crocheted her so I am sorry if I am showing it again. Also have completed my 4th page of the Coat of Arms SAL. I just love this SAL. 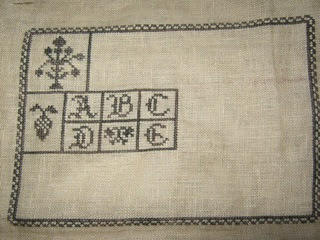 I will upload a picture when I have finished part 5 (stitching in progress). Page 6 comes out today. i Stitches' mystery SAL is lovely and have I have completed part 2 so now I can have part 3 when it comes out this weekend. Poor Carol had one lady (who couldn't take part in the SAL cause it was closed) tell her that she would copy it from the picture that are shown on peoples blogs. That is so rude. Life down here in tree change land is fabulous. We continue to love our life and now my man has even decided to take a tree change in his career and he is happily working on a local fruit orchard. He works with our son on the same nursery and they are both as happy as pigs in you know what.